Life is always better in North Myrtle Beach, South Carolina—the Atlantic Ocean, the Grand Strand, the fabulous golfing…Why not grab a little piece of North Myrtle Beach paradise for yourself by staying at SunVillas on your upcoming North Myrtle Beach vacation? The Atlantic Ocean and miles of white sandy beach serve as the backdrop for this lovely North Myrtle Beach resort, making it perfect for those who want to spend lots of time in the sun on their North Myrtle Beach getaway. Spectacular ocean views can be had from many of these North Myrtle Beach vacation rentals. Just imagine waking up to the glorious sight of the colors of the sun rising over the beach! The condo rentals at SunVillas also have fully-equipped kitchens, making it easy for you to fix coffee or meals for your guests. The pleasing décor and comfy furnishings at SunVillas provide you with a relaxing oasis in the midst of all of the North Myrtle Beach hustle and bustle. Private balconies are featured at these North Myrtle Beach vacation rentals—what a great place to relax as you savor the sights, sounds and smells of the ocean! Even though you are planning a North Myrtle Beach vacation to get away from it all, you will not want to be too far removed from work or those left behind at home—and having wireless Internet access in your North Myrtle Beach condo will allow you to easily stay connected. The blue waters of the sparkling swimming pool offered at Sunvillas will beckon you and your guests to venture outdoors in the warm South Carolina sunshine. While some in your group might choose to relax by the pool, others will want to explore the beach and all the water activities that staying right on the ocean allows. How about trying ocean kayaking, or take a snorkeling lesson? Perhaps you have been wanting to learn to paddleboard or want to collect colorful seashells to take home from North Myrtle Beach? Even if all you want to do is sink your toes in the sand as you stroll along the beach and gaze out over the horizon—SunVillas is the place to do it! You will find that SunVillas is conveniently located to everything you and your guests want to explore in North Myrtle Beach. From golf courses, to dinner theaters to outlet malls—North Myrtle Beach has it and SunVillas is a great place to stay to be close to it all! 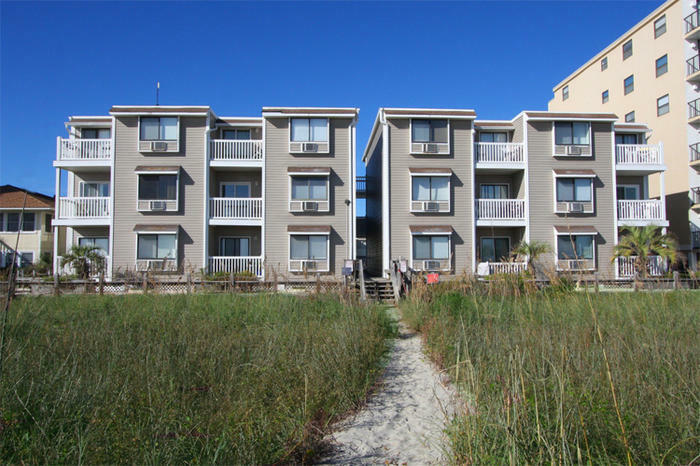 Elliott Beach Rentals is not affiliated with onsite management or the HOA of Sunvillas.